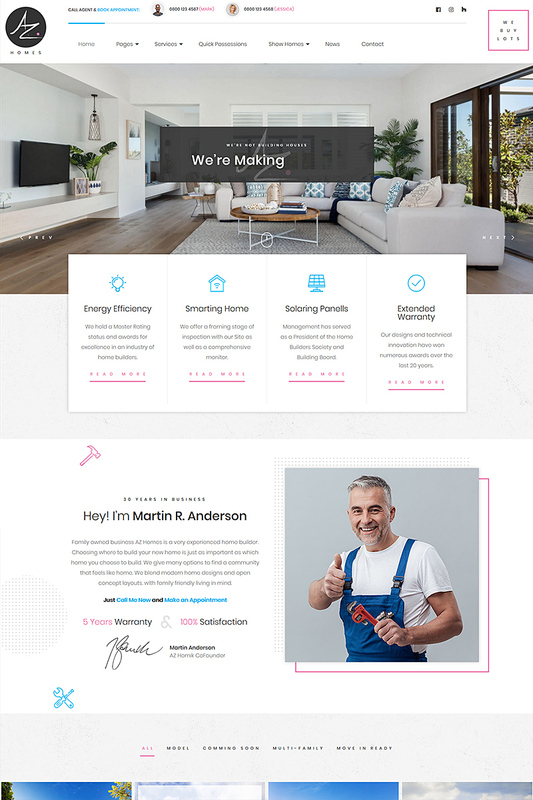 AZhomes is a full functional WordPress theme for local home builders constructions company, The theme has professional design, great animation, open source Unyson framework and built in page builder. One click demo data import tool helps to install exact copy of demo template at your server. Besides that the theme was designed specially for local building and finishing companies. We analyzed dozens of websites and considered all possible needs including buy lots functionality, ready to move in houses gallery, great block with agents information and convenient navigation through ready made houses available for sale and already sold houses portfolio. The theme will also work great for small real estate agency since property single pages are conversion optimized and look like great landing helping to convert visitors into leads. And the last but not the least, the theme comes with detailed documentation and supported by one of the best teams at the marketplace. Your project will be finished in time and hassle free, keep calm and click the buy button!